Volkswagen reveals high-performance T-Roc R with 296bhp and 400Nm! 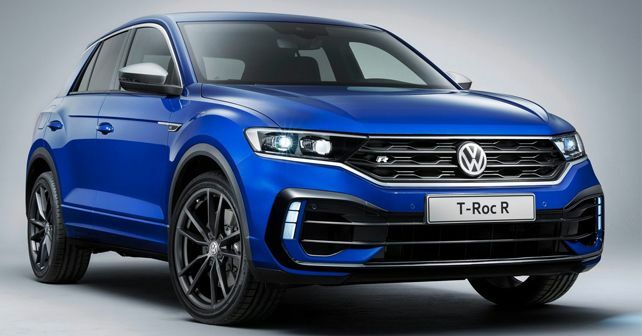 Volkswagen has infused its T-Roc crossover with some racy genes. Naturally, they’re calling it the T-Roc R, and it looks hot and quick. And, at least on paper, it seems to have all the prerequisites. The T-Roc is one of the best-sellers for Volkswagen in European markets, so a hot derivative sort of expected. And the T-Roc R is just that. Under its stubby bonnet lies the same 2.0-litre four-cylinder turbo petrol motor from the current Golf R. This means there are 296 horses on tap, along with 400Nm of torque. Power transmission duties are carried out by a seven-speed DSG automatic, and the drive goes to all four wheels. Performance wise, this high-rider will crack 0 – 100km/h in 4.9 seconds and will continue accelerating until you hit its electronically limited top speed of 250km/h. In terms of design, there are a few racy bits and bobs – including R design elements like flared wheel arches, 18-inch alloy wheels, aggressive bumpers on either ends and a 20mm lower ride height. Optional extras include a raspy Akrapovic sports exhaust and 19-inch alloy wheels among others. The T-Roc R won't have many rivals to worry about, except for its own siblings such as the Audi SQ2 and Seat Cupra Ateca. The T-Roc R will make its public appearance at the 2019 Geneva Auto Show in March.